Live 5 Most Wanted: Alexander Dingle | Crime Stoppers of the Lowcountry: 554-1111 | 1-888-CRIME-SC | Anonymous tips earn cash rewards with Crime Stoppers of the Lowcountry. BERKELEY COUNTY, SC (WCSC) - Berkeley County sheriff's deputies are looking for Alexander Elijah Dingle. Dingle, 21, is wanted on a charge of first degree burglary. 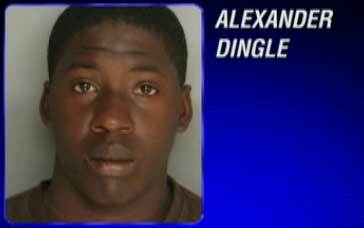 Investigators say Dingle is one of two men who broke into a home in the Cross community on September 20. "While they were breaking into the house, they entered through a doggie door and prior to entering they fired a gun into the kitchen of the house," said Berkeley County Sheriff's Cpl. John Riley. Investigators say Dingle and his accomplice grabbed what they could. "A TV was taken from the house, a flashlight that was used to take the TV off the wall was taken from the house and a window screen," said Riley. Investigators say they found Dingle's fingerprints at the crime scene and that the homeowner caught the entire break in on surveillance cameras. But deputies have not been able to find him. "He's been spotted but by the time deputies arrive, he's able to either go into the woods or leave in a car with somebody else," Riley said. Dingle stands 5'6" and weighs about 165 lbs. Authorities believe he's still in the Cross community. Anyone with information should call Crime Stoppers at 554 1111. You can remain anonymous and may earn a cash reward.